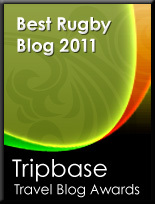 Good to see that the IRB have been incredibly busy recently addressing the issues that really matter such as...errr...the logo for the 2011 World Cup. According to IRB Chairman Bernard Lapasset it was "time to refresh the look and feel of the tournament," and the new design "brings a fresh perspective." The next step, apparently, in the look and feel of Rugby World Cup 2011 is the development of a country relevant script that will designate New Zealand as the host country for 2011 (possibly by adding the words "New Zealand" somewhere, perhaps). This will, we're told, be unveiled later this year. Can't wait. Have they really nothing better to do? Wow, and I thought there was much ado about little change in American Politics...and to think somebody actually got PAID to copy, I mean, design the logo for 2011 Rugby World Cup...back in school, we used to get punished when we copied somebody else's work. Well, that's true: rugby ball was leaning to the right in the old logo but is leaning to the left in the new one. Completely different perpective. Geometrically speaking, at least.